That is it from me for this afternoon. Sunday's football with us on BBC Sport. Thank you for your company and enjoy the rest of your weekend. Wolves defender Richard Stearman told Sky Sports: "We had a few chances and it is unfortunate for them they chucked one at us at the end there. "It was rough and ready and certainly physical, so I think a draw was a fair result. "We've got to keep picking up points and see where that takes us." "Allan McGregor has made so many telling saves for Hull over the last couple of years. "It was uncharacteristic from him, it was a simple catch with no pressure but he allowed the ball to slip through his fingers. Steve Bruce won't be too critical on his goalkeeper but that's ultimately what's cost his team." Hull City captain Michael Dawson told Sky Sports: "We didn't start well enough and they were on the front foot. "We want to be back in the Premier League and so do I so that is the aim." "Steve Bruce knows how to get out of this division, he gets his side well organised and difficult to break through. They didn't play particularly well overall in 90 minutes yet still created three or four really good chances. "I think both managers will be reasonably happy with the point. I think both of these sides will be there or thereabouts at the end of the season." Both teams will have to settle for a point. Nikica Jelavic's first-half penalty cancelled out after Allan McGregor spilled a cross and allowed James Henry to head home. Brighton are the only team in the Championship with a 100% record in the Championship after two matches. Wolves launch it forward but a free-kick is give to Hull City. Hull forward Chuba Akpom again with the shot, but this one is not on target as it sails over. Adam Le Fondre on for Wolves, replacing Nouha Dicko as two minutes extra will be played. Wolves are struggling to keep hold of it at the moment, with Hull bossing possession. Can they find a late winner? Gaps are beginning to appear in the Wolves defence and Chuba Akpom lashes a near-post effort towards goal which is well parried by Emiliano Martinez. Good few minutes this for Hull. Wolves defenders seemingly back off a Tigers counter attack and Chuba Akpom's strike is well saved by Emiliano Martinez. Then Tom Huddlestone attempts a long-range dipping effort from 35 yards that drifts a few metres over the crossbar. Sheyi Ojo powers down the left wing but Wolves lose possession when Scott Golbourne looks to deliver a cross. Sam Clucas comes off for forward Calaum Jahraldo-Martin. A name like that is a nightmare for us live text commentators. A break from Sone Aluko gets him into Wolves territory, but as he attempts a through ball to Nikica Jelavic the ball ricochets off two players. The home fans unhappy with a late challenge on Kevin McDonald on the edge of the area. As play continues, Nouha Dicko is unable to control and turn inside the area. Good build-up play again by Wolves now, but the delivery again is a poor one. Too many times this afternoon Kenny Jackett's side have struggled for quality at times in the final third. The game is spreading now, with lots of space appearing for the attackers. Hull are enjoying much more possession than before at the moment - this game could go either way as the cliche would say. Wolves have now made that change with Sheyi Ojo on for goalscorer James Henry. Hull also tweak things with Sone Aluko replacing Ahmed Elmohamady. Both managers making positive substitutions. "Akpom should scored, he really should. The goal is open for him, and he hits the post." David Meyler drives forward and lays in Nikica Jelavic. The Croatian does well to keep it in and gives it back to Chuba Akpom whose first-time strike hits the post. "What absolute quality build up. It was a lovely weighted pass from Kevin McDonald and Afobe puts in a really good ball right across the six-yard box. I think Dicko has just tried to let the ball hit him - he's got it horribly wrong." Brilliant build up this from Wolves. Kevin McDonald lifts a ball into the path of Benik Afobe and he finds his strike partner Nouha Dicko but he is unable to adjust his body to direct the ball goalwards at the edge of the six-yard box. Chances beginning to come at regular intervals now. First, Hull sub David Meyler tests Emiliano Martinez from 30 yards but it is easily saved before Nouha Dicko fires the ball at Allan McGregor from inside the area. The Scotland keeper gets more ironic cheers which I think he is going to have to get used to for the rest of the game. Good football again by Wolves who are going through the gears. A low cross finds Dave Edwards, but the midfielder is put under pressure by Michael Dawson and does not make a clean connection towards goal. First proper sight of goal from Hull City since the equaliser as Tom Huddlestone curls a free-kick just over from the edge of the area. At the other end, Benik Afobe nearly gets in as he muscles off two defenders before being stopped by a sliding challenge. Wolves boss Kenny Jackett has now opted not to make a change following the goal. On-loan Liverpool winger Sheyi Ojo was primed to enter but will have to wait as his side ramp up the pressure. "That's a huge mistake from Allan McGregor. He's an excellent shot-stopper, he's been very good for Hull - that's very uncharacteristic from him. "He'll just be hoping that Scotland manager Gordon Strachan won't hold it against him with big internationals coming up." The home fans, who have been backing their side throughout, have just taken the noise levels up a notch. A looping header from Dave Edwards is gathered this time by Allan McGregor. Ironic cheers blast out around Molineux. An innocuous looking cross from Nouha Dicko comes in and the Hull goalkeeper jumps to gather under no pressure. It spills horribly through his hands and James Henry stoops to head home probably his easiest ever goal. Credit to him for following in and a deserved equaliser for Wolves. David Meyler on for Hull City as he replaces one of three Arsenal loanees on show today, Isaac Hayden. First bit of possession in the Wolves half for Hull after the break. A neat passing moves ends with them playing it back to keeper Allan McGregor and a few boos head his way from the home supporters. Corner worked well by Wolves, as it is pulled back to Afobe - his shot from 12 yards is unable to get through a wall of defenders. Still Wolves come. First James Henry and then Benik Afobe have shots blocked by onrushing Hull defenders. Bright sunshine now in Wolverhampton as the game settles into a familiar feel, with the hosts enjoying the majority of the ball. The Wolves front two nearly combine well in the area, but the passing is not quite precise enough. Another good start of a half by Wolves. First the initial break by Benik Afobe, and when the ball comes back in midfielder Dave Edwards swings a left foot at it, but it flies over. We're back underway at Molineux. We've got you covered throughout the afternoon as well. BBC Sport will have you covered in the Premier League for Crystal Palace v Arsenal and Man City v Chelsea as well as Reading against Leeds in the Championship. In League One, it's Wigan 0-0 Doncaster after half an hour. We love the Football League here at BBC Sport. best five things for you. What did you make of that first 45 minutes at Molineux? If you support Wolves, Hull City or just enjoy your football you can share your thoughts using #bbcfootball on Twitter. So despite spending large periods of that half defending, Nikica Jelavic's penalty has Hull ahead at the break. Wolves boss Kenny Jackett will be pleased with what he has seen from his team but they are lacking a cutting edge at the moment. The shear number of white shirts in the box is stopping Wolves in attack at the moment. The build up play is good, but they're unable to find a final pass. From that Hull attack, the hosts break in numbers but Scott Golbourne's teasing cross does not find anyone. The Arsenal loanee keeper, Wolves' David Martinez, stops the Arsenal loanee striker, Hull's Chuba Akpom. Akpom gets in behind the Wolves defence and tries to lift it over Martinez but the Argentine reads it well. The corner is headed away to Tom Huddlestone and, with numbers still in the box, he launches a shot towards goal that is easily gathered. Hull's first real sight of goal since they scored. After Golbourne's break, Hull's Moses Odubajo makes an excellent sprint 45 yards down the right but his pulled back cross was unable to find a team-mate. The Tigers are looking most dangerous when they counter at the moment. Wolves continue their probing of the Hull City defence - left-back Scott Golbourne is unable to gather a ball over the top on the overlap. Hull City's on-loan striker Chuba Akpom is not happy with his team-mate Sam Clucas. The former Chesterfield man drives forward with purpose and from just outside the box, instead of laying in Akpom, pulls an effort horribly wide. The Arsenal loanee is not best pleased. Is Benik Afobe going to be the man Wolves need again? He's already scored two in two games so far this season, after 32 in all competitions during the last campaign for Wolves and MK Dons. After a deflection on another Conor Coady long-range strike, Wolves have a corner. It's swung in deep but they're unable to make anything of it. They're on top and camped in the Hull City half at the moment. How has that not gone in? Brilliant header back across the six-yard box by Wolves' Nouha Dicko and David Edwards cannot stretch enough from all of three yards out to touch home. Shades of Gazza's stretching and missing against Germany for England in Euro '96 there. Wolves almost respond immediately as Conor Coady attempts a 25-yard curler than is well parried by Allan McGregor. "Excellent penalty from Jelavic. He waited for Martinez to dive to the side and put it down the middle." On the penalty decision: "You can see as Davies was going in for the challenge he's on the wrong side of the defender, it was a clear foul. Excellent decision from referee Andre Marriner." After Hull defender Curtis Davies is shoved in the back by Kortney Hause from a corner, Nikica Jelavic steps up and strokes the penalty down the centre of the goal. That's the Croatian's first goal since February, and despite spending large amounts of time on the back foot, the Tigers lead. The ball falls kindly to David Edwards on the edge of the box, his touch is a heavy one over Michael Dawson who pulls out of a sliding challenge at the right time. Apart from when Wolves striker Benik Afobe had an effort that was cleared off the line in the opening minute, we've been lacking in chances so far at Molineux. For reasons that anger Steve Bruce, the Wolves midfielder is not booked. First card of the game as Hull full-back Moses Odubajo, making his Tigers league debut, is booked for a late challenge on Nouha Dicko. "When Wolves go long into Nouha Dicko and Benik Afobe, the midfielders are making an arc and any one of them is picking up the ball. They're playing some good football when they get into the Hull half so far." Steve Bruce is a man who knows how to get out of this league though. He's been promoted to the top flight with Birmingham (2002 and 2007) as well as with Hull City in 2013. Hull boss Steve Bruce does not look happy with what he has seen so far from his team. As they lose possession again, Bruce, in a training t-shirt this afternoon, comes to the edge of his area to shout out some instructions. Wolves dominating the early possession here, the midfield look lively and Nouha Dicko and Benik Afobe are busy up top. First bit of attacking intent from Hull, who get in down the left wing. Andrew Robertson hits a probing cross but Wolves clear easily in the end. "It's such sloppy play from Hull. With just over a minute on the clock Wolves have had two glorious opportunities and should have taken one of them." From the resulting corner, Nouha Dicko fires wide. It's fair to say the home side have started on top. Tom Huddlestone loses the ball, it falls to Benik Afobe and his effort is dribbling towards goal after a touch from the keeper before being cleared a couple yards off the line by Curtis Davies. The two teams are just going through the pre-match handshakes. Hull City will be playing in white this afternoon. It's the traditional home colours of gold and black for Wolves. Not many teams have enjoyed playing in front of the army of gold and black supporters. Kenny Jackett's side have been in impressive form in front of their home fans recently. Seen something we have missed? We'd love for you to be part of our coverage this afternoon using the hashtag #bbcfootball on Twitter. How about some match facts for you, courtesy of BBC Sport? - No team attempted more passes in their opening match than Wolves (493). - The Tigers have won three of their past six league matches against Wolves (D2 L1), although the defeat did come in the most recent game. Hull also make a tweak to their starting line-up from their opening weekend win, with right-back Moses Odubajo in for Ryan Taylor. Four players return after the Tigers beat Accrington on penalties in the League Cup in midweek - Allan McGregor, Michael Dawson, Isaac Hayden and Chuba Akpom. 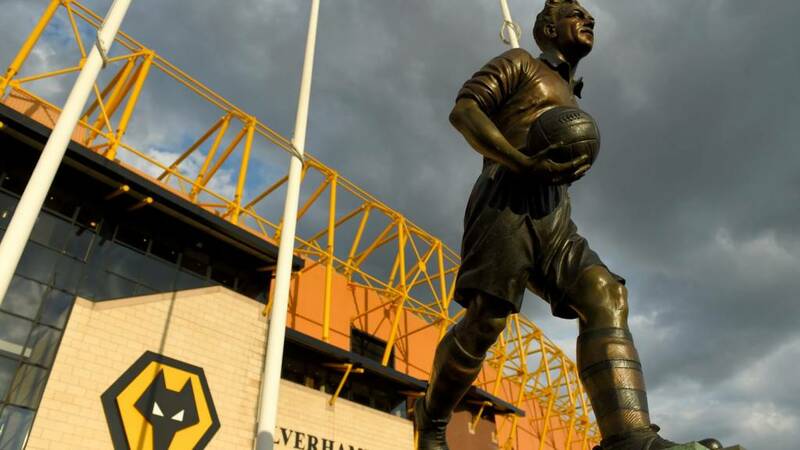 There is just one change to the Wolves starting XI from the team that beat Blackburn in the Championship last weekend, but it is quite a significant one. On-loan Arsenal keeper Emiliano Martinez, who played in the League Cup win over Newport in midweek, starts in place of Carl Ikeme. Richard Stearman, James Henry, Kevin McDonald and David Edwards also come back in. Good morning and welcome to Sunday's live coverage from the Championship as Wolves take on Hull City. Would you like some goals? There were 31 goals in the 10 Championship games yesterday, and if I remember my GCSE maths division, that is over three goals a game. Let's hope for more of the same today.